You're a FAN. A member of the Faithful. You can't be swayed by stats. Win or lose. Your team Rocks. 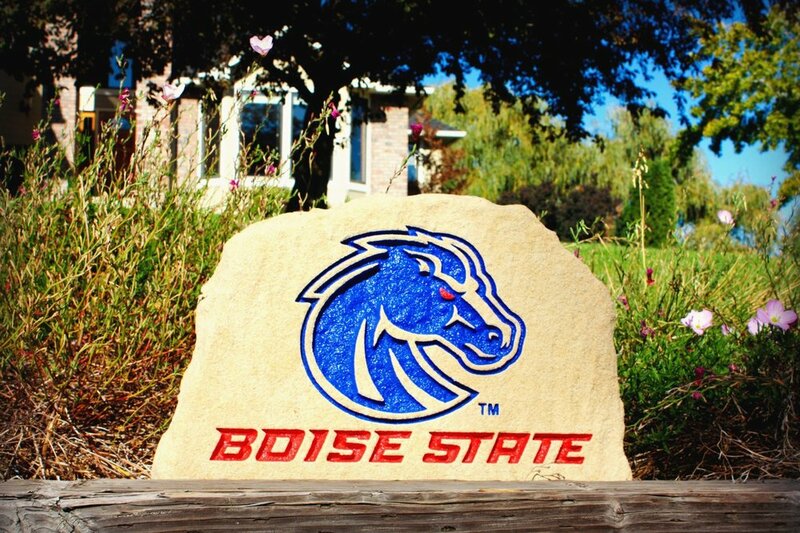 FanRocks are stones engraved with your favorite team logo to place in front of your home or office to show your pride to everyone who goes by. They are Officially Licensed Collegiate products, so a portion of the sale of each stone goes back to the universities to help fund scholarships and other university activities. FanRocks can be ordered by going to our website, www.fanrocks.com, calling (208) 373-7625 or by visiting our showroom at 4739 W. Chinden Blvd. We keep many FanRocks in stock, but it is best to call ahead to make sure we have your team. Each stone is deeply engraved by one of our skilled craftsmen. A stone-specific monument paint is used to add contrast to the engraving. An industry-leading sealer is applied to protect the stone from the elements. Click here if you are on a mobile device, and type in MYTEAMROCK to enter our monthly giveaway! *Add $35 to flagstone or sandstone prices to customize with a name or address. FanRocks can be shipped anywhere in the contiguous United States. Contact us for a shipping quote. Gift cards are available in our store, or electronic gift cards can be purchased online by clicking HERE. Each stone is engraved with a sandblasting process to produce a high quality, natural stone sign for your home or office to show off your team pride. Go Broncos! Each stone is engraved with a sandblasting process to produce a high quality, natural stone sign for your home or office to show off your team pride. Go Eagles! Each stone is engraved with a sandblasting process to produce a high quality, natural stone sign for your home or office to show off your team pride. Go Bulldogs! Each stone is engraved with a sandblasting process to produce a high quality, natural stone sign for your home or office to show off your team pride. Go Yotes! Each stone is engraved with a sandblasting process to produce a high quality, natural stone sign for your home or office to show off your team pride. Go Bengals! Each stone is engraved with a sandblasting process to produce a high quality, natural stone sign for your home or office to show off your team pride. Go Vandals! Each stone is engraved with a sandblasting process to produce a high quality, natural stone sign for your home or office to show off your team pride. Go Grizzlies! Each stone is engraved with a sandblasting process to produce a high quality, natural stone sign for your home or office to show off your team pride. Go Bobcats! Each stone is engraved with a sandblasting process to produce a high quality, natural stone sign for your home or office to show off your team pride. Go Wolf Pack! Each stone is engraved with a sandblasting process to produce a high quality, natural stone sign for your home or office to show off your team pride. Go Beavers! Each stone is engraved with a sandblasting process to produce a high quality, natural stone sign for your home or office to show off your team pride. Go Utes! Each stone is engraved with a sandblasting process to produce a high quality, natural stone sign for your home or office to show off your team pride. Go Cougars! Each stone is engraved with a sandblasting process to produce a high quality, natural stone sign for your home or office to show off your team pride. Go Cowboys!